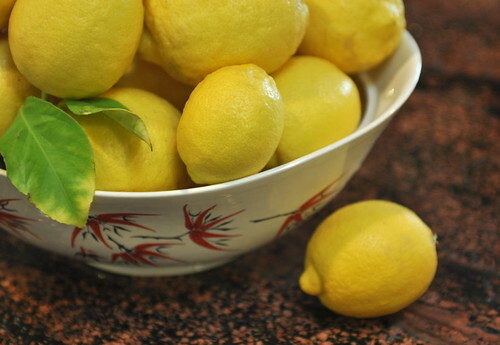 I promised a roundup of lemon recipes/uses that we use around here with all of our lemons. Lemon picking is going on in earnest around here - I can't even guess how many there are on the tree. Hundreds. Here's a list to get you started. I'll round up more as we try new things this year. Ina Garten's lemon yogurt cake - hands down my favorite lemon cake recipe. Lemon curd - tastes best if you also have farm fresh eggs. This one is all about the fresh ingredients. I like Alton Brown's recipe, but Martha Stewart's is good too. Limoncello - our quick and dirty way is to peel the zest off of about 10 large or 15 small lemons with a vegetable peeler. Pulse in the food processor to chop into small pieces. Add zest to 1 liter of vodka (we use Smirnoff - good but not expensive vodka) that you have split into 2 or 3 large mason jars. Put lids on and shake. Let sit for a week, shaking once a day. After a week, mix with simple syrup to taste (I think Jeff uses a cup of simple syrup but I'll check). Let sit overnight and store in the freezer before serving. Make sure you also juice the lemons and throw that in the freezer for when you have a need for lemons off-season. Lemon Bars - I use the recipe from the Grand Central Baking book. I sent an email to them to see if I can share it here. Regardless, I'd highly encourage you to buy this book. It's quite literally the only one I pull out. Lemon marmalade - I'm making this one tomorrow. Lemon sugar - zest several lemons and combine the zest in a food processor with 2 - 3 cups of sugar, depending on how lemony you like things. We keep ours in the refrigerator and use it in drinks, or in sweet recipes that want a lemony kick. for savory dishes, we like lemony grilled chicken (marinate in lemon juice, olive oil garlic and rosemary), lemony chickpea stir fry, lemon risotto, green beans sauteed with lemon zest and mint, shrimp marinated in lemon juice, olive oil, garlic and rosemary), and the list goes on. Pair it with fish and make a buerre blanc sauce. Pair it with garlic and oregano and lamb. Make hollandaise. Lastly, if you're lucky enough to have a bumper crop of lemons, just juice them and save the juice for later, along with the zest. You'll be forever grateful that you did. And because I know some of you are socked into winter with no lemon tree in your yard, I'm giving away a USPS large priority mail box full of lemons to a lucky reader. Just leave a comment on this post by Friday, January 7 telling me your favorite way to use lemons and have a chance to win. i'm not entering, 'cause i'm-a just come & get some. k? Yeah, youre disqualified from the drawing based on proximity. If you can walk to my house, you cant win. You have to come over and pick your own. heck yeah, I'm entering! I'm so jealous!! 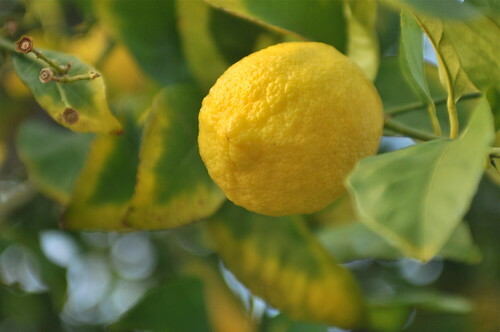 This year I WILL plant a lemon tree (and protect it like crazy when we have freezes). My favorite way to use lemons is any kind of lemon dessert, not that I need any of that right now. My personal favorite is lemon sorbet but if you asked anyone else in this house they'd say plain, old-fashioned, lemonade. I love ina's cake and lemon bars are a favorite around here, but that marmalade sounds incredible! And the thought of super fresh lemons in January makes me super happy. Thanks for the chance! I know I already got some, but I would do anything for more. Oh, sorry, my favorite use for lemons is EVERYTHING. I love everything lemony that could possibly exist. I suppose lemon cake with lemon glaze would be a fave, or even good ol' lemonade. oh, i am stuck in the frozen tundra of canada and wish so much that i could have a lemon tree in my backyard. how much would i love these lemons if you're able to ship to the great white north. i am a huge fan of all lemony goodness, lemonade, lemon cake, limoncello ;o) i love it all! Oh, my goodness...lemons are a treat around here--I use them in my iced tea (year-round favorite drink) and for ginger-lemon tea. I had to call them an exemption to my local-produce diet because I love them so, but that makes me feel guilty and so I use them sparingly. I'd love to win and try some of your recipes! wow, that tree is IMPRESSIVE! 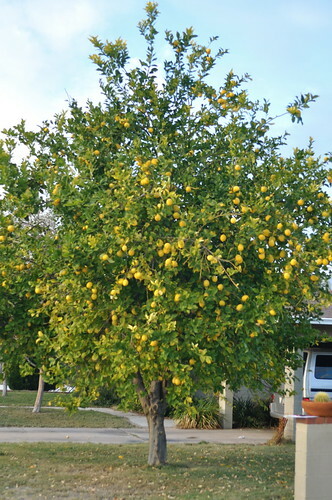 I've never seen a lemon tree in person, I bet it smells heavenly? What would I do with a box of lemons... well, there is the lemon bundt cake that I like to make, but that only takes one lemon. I would love to make some homemade lemon curd. And your lemon bars... I crave those every time you mention them. I guess a whole box of lemons would let me do all three.. and still have leftover to make a lemon drop martini too, right? In any case, if I win, I'll make sure they don't go to waste! can i just say i'm yellow with jealousy over your lemon crop! holy cow, what a beautiful tree! i love making lemon-ginger marmalade, but what i really want to try is preserving them in salt and oil. oh my god. 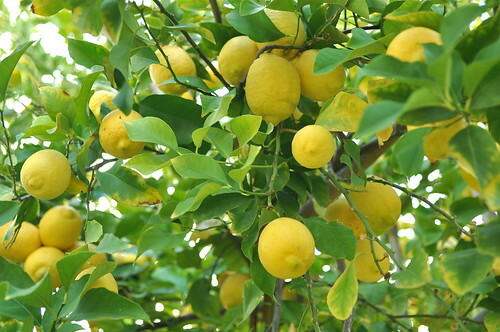 to the number of lemons on that tree, and to the fact that you're giving away a box of them. want. please? even though we are a one income family right now, I'd still even pay for you to ship me that gorgeousness. (don't tell my husband). I use lemons for everything fresh, on grilled vegetables all through the summer. Although I am a big fan of that olive oil cake with a whole lemon and orange. And I'd love to make me some lemon curd. I cannot even imagine having a tree like that in my backyard!! Wow. I haven't adventured much with lemons, just lemon bars (which I often ruin but eat anyway) and using a lemon for cleaning. Although, lemon squeezed into hot water and honey seems to be the magic elixir for my 5 yr-old and I love that, too. I imagine my life would be much more exciting with easy access to lemons, instead of easy access to rhubarb in the summertime. Lemon squares would have to be it for me. I'm so jealous though, I'm surrounded by snow and ice and I don't think there is even enough sunlight for me to grow a lemon plant indoors! Enjoy your lemons! Lemon curd I think. Though I'm no dairy/soy and I'm not sure about using margarine in it. Yuck, right? I love lemon bars. I'm interested in that Grand Central bakery recipe. Love a lemon/shrimp/arugula pasta recipe that we make. Pretty much anything and everything. what a fantastic giveaway! I'm in to win! ;-) Fave way is lemon bars made from your fave recipe using your lemons and eaten at your house while watching Glee with the kids. My goodness...those lemons would bring a whole lot of brightness to gloomy central new york! What a great tree. Mostly I put lemons in my water for vitamin c and that zing. Not so many lemon trees here in new England. Gorgeous tree! I'd have to say that fresh-squeezed lemonade would be my first thought. Here in Minneapolis, with all the snow right now, it would taste just like summer! Pick me! Pick me! What a crop you have this year! I just finished off the last small batch of lemoncello I made over the holidays. That lemon chickpea stir fry sounds good. I quite like savory lemon dishes. Oh my goodness! I would love this! A taste of summer in the winter! My favorite thing to make with lemons is cake--I can't even begin to imagine how delicious it would be with fresh lemons! Oh, my, I can't even imagine how sweet it would be to get a big ol' box of lemons in the middle of a New Jersey winter! All images and text copyrighted by Sarah Jackson 2007. Please ask for my permission before using my images or text.